It’s been few weeks since the September patch came live in the game. Recently, Inferno Dragon was released after two weeks since Mega Minion became available. There are still two more new cards to be released this October and it won’t be long enough to hear another update for this month, so let’s do a quick round-up and update about the most recent changes and its current effect in the game. Giants are still good despite the decrease of 5% damage power. Because of this slight changes, killing the Giant last won’t be as punishable as before. The reduced damage will give you a slight advantage to handle the troops in the backline first, while the Giant attacks your building/tower. Change of Rage spell is really fascinating because of its low elixir cost. Before, 3 elixir Rage spell can easily go to waste if you’re troops get countered easily. Now, the 2 elixir Rage spell becomes less punishable if you miss your opportunity. You can instantly turn the tide with an unexpected Rage spell with swarm troop (Minion Horde, Skeleton Army, and etc). Plus, it’s really fun to use with the different combinations(like Three Musketeers and Witch), giving you a two-second boost while your enemy doesn’t have the elixir to counter attack. The Mirror received a great buff this patch. It became very rewarding to level up your Mirror card to its max level as you can get max level +1 of the copied card. You can even bypass the cap in tournaments, giving you a slight advantage to your opponents. If you want to know the statistics of the max level +1 cards, here’s the link to the Mirror’s wiki page for the max +1 statistics for copied cards. The Lightning spell now has a stun effect like Zap. How cool is that?! The Lightning spell just got more awesome to use. 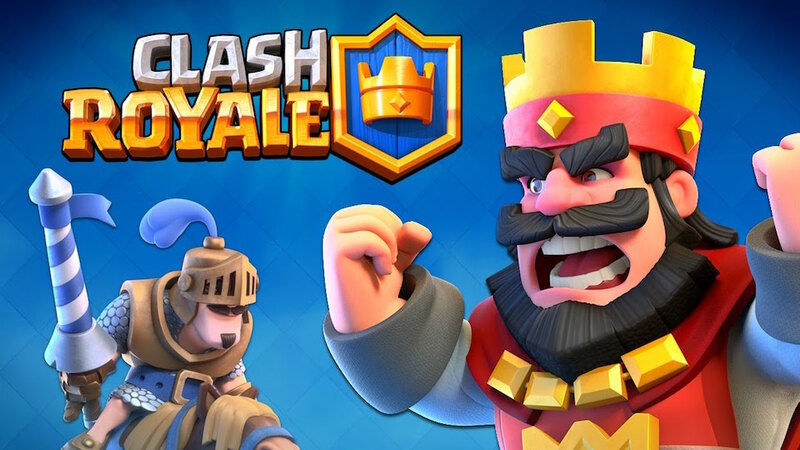 Aside from its ability to instantly kill medium health troops, like Wizards, Witch, Three Musketeers, now it can perform the Zap’s ability reset enemy targets, including the Inferno Tower and Sparky’s attack timer. 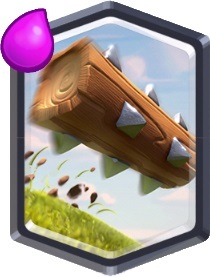 It can counter annoying Sparky decks by resetting the Sparky’s attack and killing off their Wizard. No more Sparky-Wizard combo against a Lightning spell user. The Log now knocks back all ground troop. Though it’s not a big change, it’s a good buff since they can’t push away large troops like Giant, Royal Giant, and Golem before. 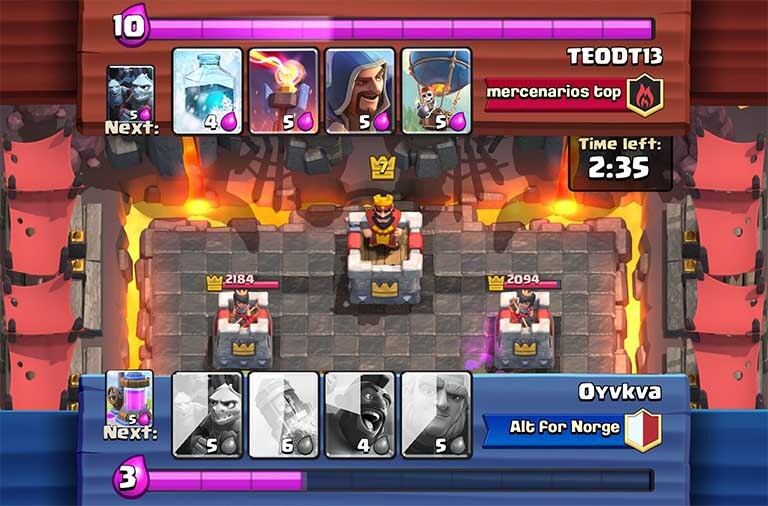 Just with 2 elixir cost, you can now delay these tanks before reaching your tower. Lastly, the Bomber’s changes aren’t noticeable. The 2% decreased HP went to damage increase. Bombers are strong against The Witch, Barbarians, and other swarm ground troops. But because of its fragile hit points, it won’t last too long against damaging, higher HP troops. The shop offers Epic Chest and Legendary Chest from time to time, yet both chests can be obtained by winning normal battles. The chests can only be bought once when they are available in the shop. The Epic Chest contains 10 Epic Cards. Yes, only Epic cards! So if you have Epic cards that you want to level, this is a great deal to get them. This chest costs 10,000 gold. 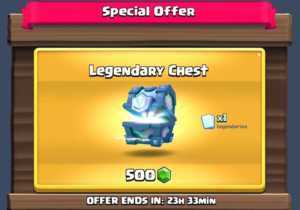 On the other hand, the Legendary Chest contains 1 Legendary card for the price of 500 gems. This is really good because if all this time you want to get a Legendary card, you can now own one! Additionally, you don’t have to be in a certain Arena to get what Legendary card you’ll receive from the chest. It gives random Legendary Card from all Arena so you’ll have a chance to get higher arena legendary card even if you haven’t reached them yet! Have a chance to get Princess, Sparky and other legendaries! There is also another new offer called, Arena Packs. 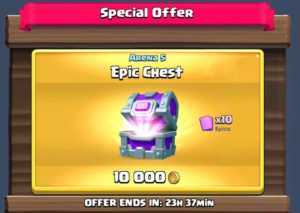 It is a special one-time offer from the shop once you reach a new Arena. This is great for beginners and newly created accounts. If they want to get strong faster, buying the Arena Packs will give them the advantage to collect and level up their card fast. The Arena Pack is a great deal because of the total value it costs compared to buying cards it in the normal price. It’s definitely a good to invest if you’re a starter. 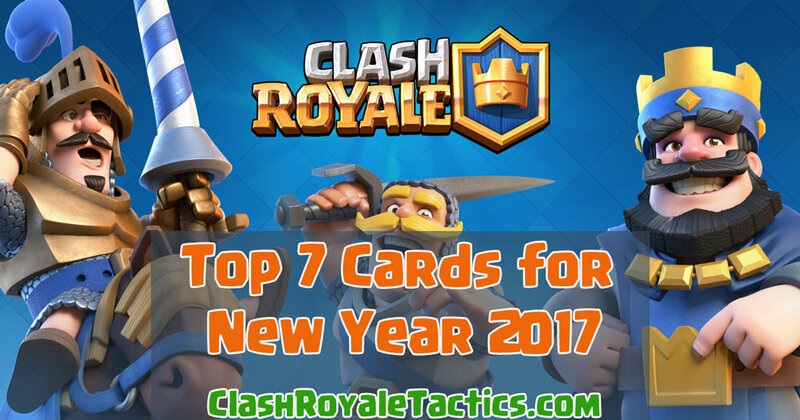 And the last new update from the shop, the New Card Offer. In this patch, there is a total of 4 new cards to be released. If you’re lucky to receive one of the new cards from the chest, it will be available in the shop for a limited time. With this update, you can now play with your friends! Just link your Facebook account and you can challenge them as long as their online! You can also check who’s online and spectate them while they battle their opponents. Mute option. Sometimes it’s annoying when your opponent keeps on spamming the emotes to distract you in battle, especially when you’re on the losing side. By having a mute option, it prevents your opponent from teasing your gameplay, and as a result, having much more comfortable battles. 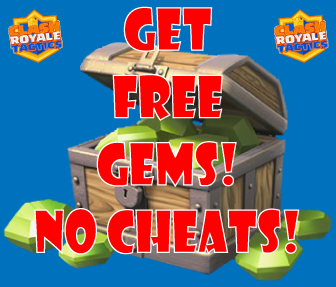 Excess Crowns from completing crown chest will continue to the next if you have another crown chest to complete. It makes it easier to complete overlapped crown chest when you win battles. 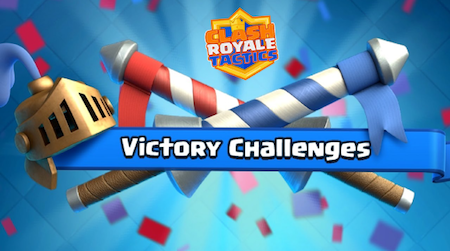 They added New Achievements in the game for Tournament Challenges, plus a new challenge mode which is available for players level 8 and above. These new challenges have a different ranking condition than normal tournaments. In normal tournaments, you have to earn tournament trophies to rank and get the top prize. Here, there is only a total of 12 battles. In each win, the amount of gold and card will increase until you get to the 12th round. If you win all the 12 battles, you’ll receive the top prize. However, losing 3 times will cause the tournament to end and only receive the prize depending on your position.